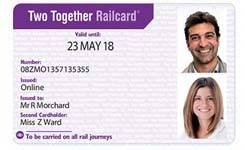 The Two-Together Railcard is for two named people travelling together aged 16 or over and allows &frac13; discount on Anytime, Off-Peak and Advance rail tickets in both standard class and first class. It is valid for one year and costs £30. You can travel with a best friend or with one of the family. You can purchase or renew your Two-Together Railcard online and your Railcard doesn’t just save you money on travel, it also saves you money with Railcard partners too – on days out, museums, hotels and more. Check the Journey Planner and see just how much you'll save with your Two-Together Railcard. Discounts also apply to plusbus, many rover and ranger tickets, Caledonian Sleeper services, some rail/sea journeys to the Isle of Wight with Wightlink, Red Funnel Ferries and Hovertravel and Travelcards (restrictions apply). The Railcard costs just £30 - that’s £15 each. So after a couple of trips the card will have paid for itself. The &frac13; off applies to most adult fares throughout Great Britain.